Pet owners who are serious about pet-proofing their home should start with their own medicine cabinet. Nearly 50% of all calls received by Pet Poison Helpline involve human medications – both over-the-counter and prescription. 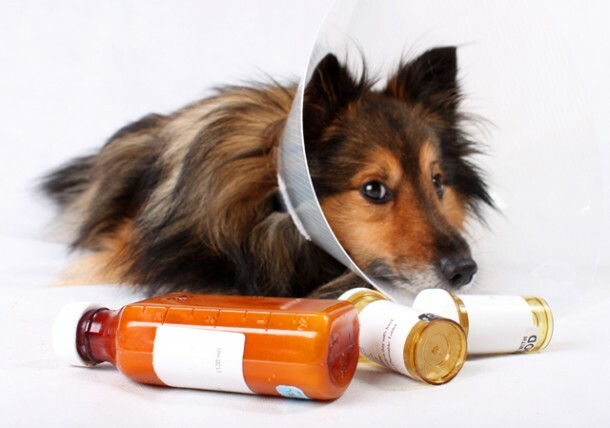 Whether Fido accidentally chewed into a pill bottle or a pet owner with good intentions accidentally switched medication (giving their pet a human medication), pet poisonings due to human medications are common and can be very serious. Pets — especially dogs — get under-active thyroids too. Interestingly, the dose of thyroid hormone needed to treat dogs is much higher than a person’s dose. Therefore, if dogs accidentally get into thyroid hormones at home, it rarely results in problems. However, large acute overdoses in cats and dogs can cause muscle tremors, nervousness, panting, a rapid heart rate and aggression. It is also important to note that while a medication may be safe for children, it may not be safe for animals. In fact, nearly 50% of all pet poisonings involve human drugs. Pets metabolize medications very differently from people. Even seemingly benign over-the-counter or herbal medications may cause serious poisoning in pets. If your pet has ingested a human over-the-counter or prescription medication, please call Companion Animal Hospital.